Do you remember this post, where I talked about how, after my father passed away, I began to associate the "blowing out" of street lights with him because, frequently right after his death, when I was walking the dog or driving down the street a street light would go out at the precise moment I passed it? In fact, the day "Nana" passed away Annalisse texted me to say a light on campus had blown out just as she was walking by it, and she said hello to Grandpa and Nana (and felt a bit of comfort in that). Well, just an update to say this hasn't happened to me in a while. I especially wondered if I would notice it more after my mother passed away, but it's been almost a month and NOTHING. Strange, huh? I'm thinking she's keeping him so busy "up there" that he doesn't have any more time to send me signs. Either way, I'm glad they're together again, but miss those comforting signs just a little. Happy Anniversary to us! Twenty-Seven Years. Hard to believe!!! 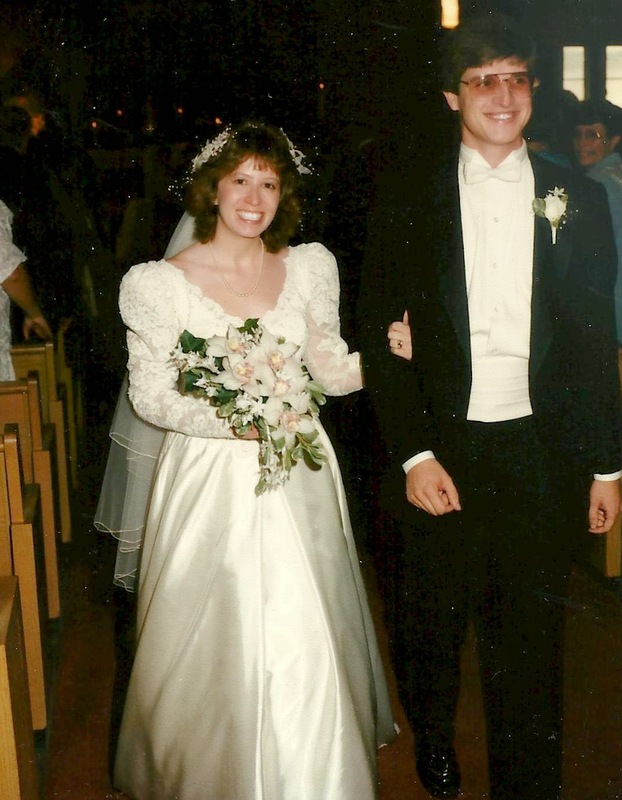 As I've stated on the blog before, it's weird and wild and exciting to think we've been married for 27 years, but sad, too, missing all our family members who have left us. I think back to when my parents had a 25 year anniversary celebration and they seemed so old then! And just to blow your mind a little more, Mark and I started dating when I was 18...and we all know how old I am now! There have been ups and downs (and really high ups and really low downs), but here we are alone again, with no one to keep us company but the dog! We will be celebrating our special day with dinner out at Mr. Dominics in Fairport.Then, on Sunday, Nicole and I will head to Syracuse, pick up Sissy, and go to look for bridesmaids dresses. In the meantime, today is a celebration of US! Sweatpants after work, bed at 9. It's happening. Last week: 80 degrees and sunny. This week 50 degrees, windy and cloudy. Noooo!!! As with the last couple of years, last week I traversed 700 miles in three days covering the North Country grad fairs. That gets old quick. Anyway, it was great to see my colleagues again, and I had fun catching up over a glass of wine (or two). This weekend was the epitome of everything that is awesome about Fairport. There are many days when I'm amazed that we are able to live in such a wonderful town. Here's why.